A few months back, I started a port barrel. 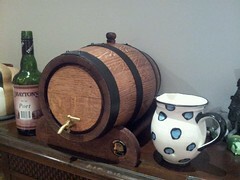 Said barrel was 8 litres and I filled it with a rich tawny from Draytons. I did very well and managed not to drink from it for most of summer. Alas, I couldn’t last and started drinking from it several weeks ago. I love the tap thing. I put my glass under and turn the handle; shutting it off when the glass is sufficiently full. It hasn’t really been in the barrel long enough to mature properly but it is tasting yum. I don’t know if it’s improved in the 4 months but it certainly hasn’t degenerated. I’ve topped it up regularly. Draytons originally sold me a 10.5 litre plastic flagon of tawny. It took more than 8 litres to fill the barrel as the wood soaks up quite a bit. I’ve probably drunk a litre or so from that. Anyway, the other night, I forgot to put the lid back on the flagon when I was doing my top up. I noticed the following night and while it was still drinkable (from the flagon), the pleasantness had dropped substantially. There was probably around a half litre or so left. Thus yesterday, along with a few friends, I headed back up to the Hunter for a refill. If you wash out the flagon (don’t use soap! – I used warm water) they’ll fill it up and give you a discount. The standard price is $75 for the 10.5 litre and as a refill of the existing flagon that dropped to $63 or about 6 bucks a litre ie as cheap as cask wine though it’s a decent drop. They also talked about adding a bit of rum to improve the flavour. I’ve not been keen on this as the rums I’ve sampled have been strong and overpowering. Turns out Draytons also sell a rum port and I had a taste of it. Much, much softer than I expected as the rum seemed to mellow out the port. So I bought a bottle. I’ve just decanted out some port from the barrel into a bottle and added about 700ml of the rum port. For the next few weeks at least, I’ll be back to pouring port from the bottle, which will give the barrel time to start blending in the rum.